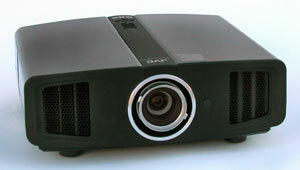 Last March JVC started shipping the DLA-RS1, a 1080p projector featuring D-ILA technology (JVC's proprietary version of LCOS) with a high native contrast ratio of 15,000:1. This month, the DLA-RS2 comes to market, offering even higher performance at a higher price. JVC will continue to market both models at two different price points. 2. The contrast improvement on the RS2 derives from improved light polarization wich reduces light scatter into the lens. The net effect is that contrast and black levels are improved, but actual lumen output is reduced by about 18%, as measured against comparable operating modes on the RS1 (on our two particular test units). 3. Powered zoom and focus has been added to the RS2. On the RS1, the zoom and focus controls are manual. 4. The RS2 has a Vertical Stretch function for high definition signals to accommodate an anamorphic lens, whereas the RS1 does not. 5. The RS1 is HDMI 1.2 compatible, and the RS2 is HDMI 1.3. 6. The RS2 has an overscan adjustment for component video inputs, so that a 100% full frame picture can be obtained. On the RS1, overscan automatically cropped the image from analog signals by 2.5% on each edge without the ability to adjust it. 7. Current MSRP on the RS2 is $7,995, and the RS1 is $5,495.